Math nerds like me call these natural numbers. A prime number is a particular type of natural number. Every natural number greater than 1 is either prime or composite. 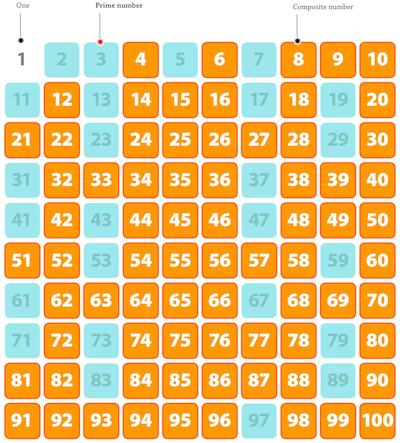 The blue squares below represent every prime number between 2 and 100. To answer today’s question about whether two is prime, we can check the table above. Yes, two is a prime number. That’s because two’s only factors are 1 and 2. To explain the difference between prime and composite numbers, we need to understand factors. “Factors” are numbers that can be multiplied together to compose larger numbers. For example, 2 and 3 are both factors of 6 because they divide evenly into 6. 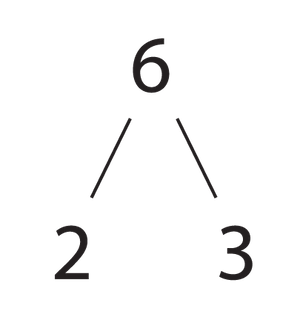 Six is not prime because its factors are 1, 2, 3, and 6. We call six a composite number because more than two factors compose it. In contrast, a prime number has only two factors: 1 and itself. Take 7 for instance. Seven is prime because its only factors are 1 and 7. Are you ready for a fun fact? I hope you’re sitting down because this is big! Two is the only even prime number! Every other even natural number (4, 6, 8, 10…) includes at least three factors: 1, 2, and itself. Therefore, besides the number two, only odd numbers can be prime numbers. The largest known prime number is 2^77,232,917 − 1, a number with 23,249,425 digits. It was discovered just last year by the Great Internet Mersenne Prime Search. Euclid proved that there is no largest prime number. Still, mathematicians and enthusiasts continue the search today. Do you have a favorite prime number? 79 is my personal favorite.